Limited to 200 units - only 10 of which are coming to the US. It’s been 40 years since BMW launched its flagship 7-Series luxury sedan in 1977 as a response to the dominant Mercedes-S Class, and to commemorate that milestone the German automaker will be revealing a new special edition model at this year’s Frankfurt Auto Show in September. 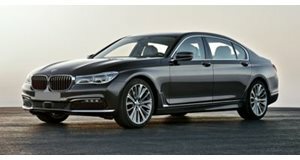 Called the 7-Series Edition 40 Jahre, which is German for “40 years” if you hadn’t guessed, only 200 units of the celebratory luxury sedan will be built based on the current generation 7-Series at the same Dingolfing plant where the original car rolled off the assembly line. Only 10 are being reserved for the US, however. While there’s no word on how the US version will fare, customers in Europe will be able tailor their 7-Series Edition 40 Jahre to their unique specification. This means there will be a choice of six, eight and 12-cylinder engines across the entire 7-Series range, from the four-cylinder 740e iPerformance plug-in hybrid, to the V12 biturbo M760Li, as well as regular and long wheelbase options. Only two paint finishes will be available to distinguish the special edition 7-Series, however, with a choice of Forzen Silver or Petrol Mica metallic from the BMW individual range. As standard, you’ll also get the M Aerodynnamics package with sportier bumpers and side skirts and a black kidney grille, as well as 20-inch V-spoke alloy wheels. Elsewhere, 40 Jahre badges adorn the B-pillars and doorsills to signify the special edition. As for the cabin, the 7-Series 40 Jahre models are fitted with BMW Individual Merino fine grain leather upholstery in a choice of two contrasting colors: Smoke White and Cohiba or Smoke White and black. Comfort seats are fitted at the front and rear as standard, and BMW is offering a choice of piano black wood inserts or brown Eucalyptus trim. There’s no word on pricing yet, but the 7-Series Edition 40 Jahre will go on sale this October.